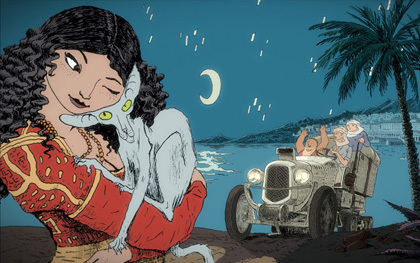 Joann Sfar has established himself as one of the most important voices in Franco-Belgian comics with such well received work as The Rabbi’s Cat, Klezmer: Tales of the Wild East, Sardine in Outer Space series, The Professor’s Daughter, the Little Vampire series, and contributing to Lewis Trondheim’s Dungeon series. His first work as a filmmaker, Gainsbourg: A Heroic Life is currently in platform release and is a biopic of ’60s Frecnh pop star Serge Gainsbourg. Sfar took some time to discuss the film with FOG!, as well as his own connections to Gainsbourg and his future film projects and pop culture obsessions. Joann, you’ve established yourself as a graphic novelist. Were you always interested in filmmaking? No! I was always interested in films, but my passion for cinema found a very natural way to express itself through comic books. I grew up with Roger Corman and Terence Fisher movies. Disney also. When I was too young to attend horror movies, my grandfather bought magazines with monsters for me and I made photo-novels by cutting the pictures and adding texts. Those were my first stories!!! I know some of your comic influences are as diverse as Will Eisner to André Franquin to Hugo Pratt to John Buscema. Who are your cinematic influences? As I mentionned, horror movies. All of them. Fantasy movies. All of them. From James Whale, Todd Browning to Murnau. I also revere Italian comedies, and I spend a lot of time watching Fellini, Dino Risi, Etorre Scolla’s stories. Last but not least, I am a huge and compulsive fan of Sergio Leone…and all his children: John Milius, Mel Gibson, Quentin Tarantino, Robert Rodriguez. I also have a guilty passion for musicals, such as An American in Paris which was a huge inspiration for Gainsbourg. What else? If I could marry (Peter) Jackson or (Guillermo) del Toro, I’ll be delighted! By the way you must know that my whole prosthetic and performing crew came from Pan’s Labyrinth. What attracted you to Serge Gainsbourg? He was the only French person with an attitude on TV when I was a kid. He was a mix between Dean Martin and Johnny Rotten. Our parents hated him. All the kids loved him. And me especially. I came from an observant and classical Jewish family. Watching this Russian Jew who slept with Bardot and Birkin, and who always made dirty jokes made me believe that it may be cool to grow up. And of course, afterwards, it was too late. When tackling a person’s life, first as a screenplay and then as a film, how did you begin to take such a huge subject and create a narrative? Do you feel that there are challenges in trying to understand a stranger’s life and is there any responsibility when portraying your protagonist as a flawed, human being? story. The story is certainly filled with lies…but those are HIS lies. Both you and Gainsbourg are both Jewish. Do you feel that your religious background in any way either informed you about him or do you feel any connection to him as a result? No. His Judaism is quite different from mine. I come from an observant family whereas his parents could not care less about religion. 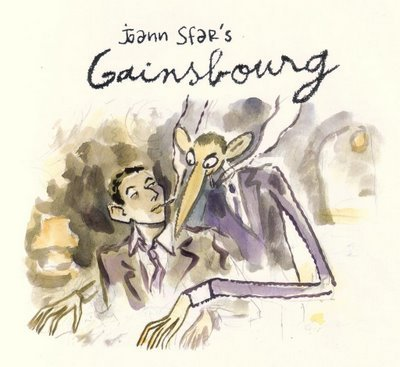 I was interested in the fact that Gainsbourg learned about his Judaism because of the French police. Because they gave him that yellow star. I love this idea of police giving you a religion!!! It is very punk! 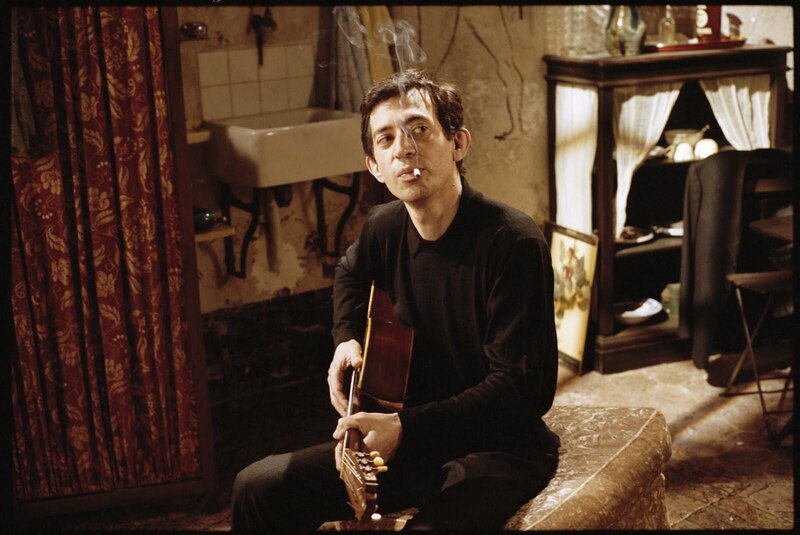 How did you find Eric Elmosnino (who portrayed Gainsbourg in the film) and what you you think he brought to the role? On stage!!! He said that he did not want the burden of a historical or museographical representation. He told me “let’s pretend the guy was invented by you and comes from your drawings only”. Elmosnino allowed me to go for a lot of freedom and fun and light things. Your next film is an animated adaptation of your book, The Rabbi’s Cat. What did you find more challenging, working with live actors or animating something that you created previously? Those are two different kind of pleasures. I have to confess my only trouble with animation is it is soooooo slow: I draw five comic book pages a day whereas an animator does one second!!! So I had to learn patience. Strangely, live action is closer from the energy of comic books in my perception, we can rely on will and instinct. But i have to confess I had a huge disappointment with the return of Duke Nukem. And I was even more sad to discover what happened to Conan. I grew up with Buscema, Howard, Frazetta and Milius. I was extremely sad to discover what happened this month. If there is a Crom, a retaliation should occur. I loved The Expendables. I go on the Hobbit blog every day. I am reading Stan Nicholl’s Orcs. And I am truly disappointed there was never a sequel to “Red Neck Rampage”. My next movie: I started to work on Little Vampire, with producer John Carls who already made Rango and Wild Things. It’ll be animation and adapted from a comic book of mine. For more information about Gainsbourg, visit the film’s official site HERE!